The work of Hope Partnership includes empowering new church planters through assessment, discernment, training, coaching and peer support. Hope Partnership coaches walk alongside new and transforming church leaders. Hope Partnership for Missional Transformation’s mission is to empower courageous leaders to guide the Church into life-giving expressions of ministry for this era of God’s mission. As a general ministry of the Christian Church (Disciples of Christ), Hope Partnership is home to New Church Ministry and transformational leadership programming. Our church planters remain committed to answering God’s call . . . to serve their neighbors, spread the gospel, and make more Disciples. Please help our new church movement continue to take root, bear fruit . . . and grow more Disciples every day! Hosted by Pastor Terrell L. McTyer, Minister of New Church Strategies, New Church Hacks provides practical (and sometimes peculiar) prompts for churches from start to restart. Why only be new or better, when you can be both? New Church Hacks is jam-packed with clever solutions to tricky problems and empowers courageous leaders with the tools, tips and how-tos to start, sustain and strengthen congregations. Could your congregation use some help? Maybe in re-imagining its mission to make your church more relevant to your community? Or, maybe in supporting and revitalizing your leadership through dynamic guidance and coaching programs? These are just some of the services offered by Hope Partnership for Missional Transformation. 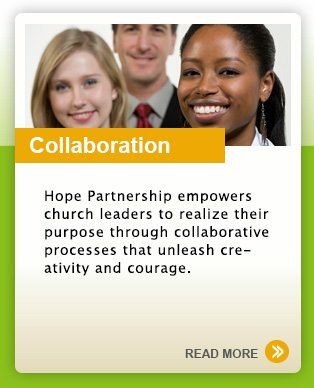 Wondering which Hope Partnership service is right for your congregation? Check out this Tool for change, developed by Hope Partnership staff. It’s a simple needs self-assessment. You answer a handful of questions about your congregation in each of seven modules to find out which Hope Partnership service best addresses your current situation. It costs nothing and takes just a few minutes. After you complete the assessment, return it to info@hopepmt.org and a Hope Partnership advisor will be in touch with you. 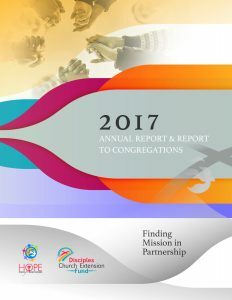 Hope Partnership for Missional Transformation and Disciples Church Extension Fund are pleased to share with you our 2017 Annual Report & Report to Congregations. We hope that you enjoy learning about how our friends and partners have inspired and empowered new ministries across the life of the Church. Thank YOU for working with us to help congregations thrive and transform communities! Beginning in 2018, Hope Partnership has formed a groundbreaking ecumenical partnership, bringing together the best practices and services of mainline Protestant denominations through their respective church extension funds, using an innovative ecumenical model to serve each other. 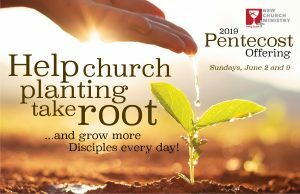 Participating church extension funds are from the Christian Church (Disciples of Christ), Presbyterian Church (U.S.A.), Episcopal Church, and the United Church of Christ. Church extension funds provide capital financing to churches and ministry programs for building purchases, construction, renovation, as well as property redevelopment projects. The best practices of programs and services, a new network of colleagues, decades of experiences, leadership, and faith have been pooled to provide transformational ministry services to a wider ecumenical network of congregations. “This is a visible expression of true ecumenical partnership,” says Gilberto Collazo, president of Hope Partnership. Hope Partnership for Missional Transformation was founded in 2012 by the Christian Church (Disciples of Christ) in a collaborative effort between Church Extension (now Disciples Church Extension Fund), Disciples Home Missions (DHM), and Higher Education and Leadership Ministries (HELM) to provide leadership development programs, assist Disciples churches with ministry assessment and viability, and facilitate the resulting transformation of both leadership and ministry. Read more about the new ecumenical partnership. 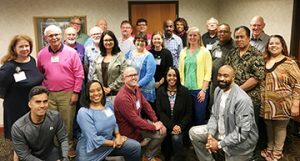 Church leaders gathered in Indianapolis May 17-19 for the first annual Coaching Academy hosted by Hope Partnership for Missional Transformation’s ecumenical services. The event brought together clergy and lay leaders from four mainline denominations to train a team of coaches that will walk alongside congregational leadership in the final phase of Hope Partnership’s transformation services. The three-day event featured coaching demonstrations, in-depth training on coaching procedures and best practices, and educational sessions with keynote speaker Robert E. Logan. Logan is the founder of Logan Leadership and co-author with Sherilyn Carlton of Coaching 101: Discover the Power of Coaching. Coaching Academy is the second training event held by Hope Partnership under the groundbreaking ecumenical collaboration announced earlier this year by the Presbyterian Church (U.S.A.) extension fund and three other mainline Protestant denominations: Episcopal Church, the United Church of Christ, and Christian Church (Disciples of Christ). Read more about the Coaching Academy. “What is God calling our congregation to do and be in this time and this place?” Hope Partnership’s New Beginnings Assessment Service helps congregations assess their strengths and opportunities as they seek to answer this question.